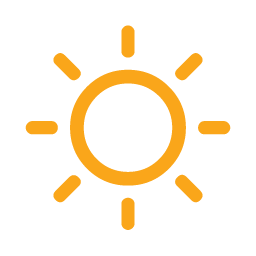 7:00 am 54°F 47°F 77% Sunny. Quite cool. 51°F 8 mi	 9mph /WNW 1% 0.00 "
8:00 am 55°F 47°F 73% Sunny. Cool. 53°F 7 mi	 10mph /NW 1% 0.00 "
9:00 am 60°F 48°F 64% Sunny. Cool. 60°F 9 mi	 11mph /NW 1% 0.00 "
10:00 am 64°F 48°F 57% Sunny. Cool. 64°F 9 mi	 12mph /NW 1% 0.00 "
11:00 am 67°F 47°F 50% Sunny. Cool. 67°F 10 mi	 13mph /NW 1% 0.00 "
12:00 pm 68°F 46°F 45% Sunny. Cool. 68°F 14 mi	 14mph /NW 1% 0.00 "
1:00 pm 70°F 45°F 41% Sunny. Cool. 70°F 18 mi	 15mph /NW 0% 0.00 "
2:00 pm 71°F 44°F 38% Sunny. Cool. 77°F 19 mi	 16mph /NW 0% 0.00 "
3:00 pm 71°F 43°F 36% Sunny. Cool. 77°F 20 mi	 17mph /NW 0% 0.00 "
4:00 pm 71°F 42°F 36% Sunny. Cool. 77°F 21 mi	 17mph /NW 0% 0.00 "
5:00 pm 70°F 42°F 36% Sunny. Cool. 70°F 18 mi	 16mph /NW 0% 0.00 "
6:00 pm 68°F 42°F 38% Sunny. Cool. 68°F 14 mi	 14mph /NW 0% 0.00 "
7:00 pm 65°F 42°F 44% Sunny. Cool. 65°F 9 mi	 13mph /NW 0% 0.00 "
8:00 pm 63°F 43°F 49% Clear. Cool. 63°F 9 mi	 11mph /NW 0% 0.00 "
9:00 pm 59°F 43°F 56% Clear. Cool. 58°F 8 mi	 9mph /NW 0% 0.00 "
10:00 pm 56°F 44°F 63% Clear. Cool. 54°F 8 mi	 8mph /NW 0% 0.00 "
11:00 pm 56°F 44°F 64% Clear. Cool. 54°F 7 mi	 8mph /NW 0% 0.00 "
12:00 am 54°F 43°F 67% Clear. Quite cool. 52°F 7 mi	 8mph /NW 0% 0.00 "
1:00 am 52°F 43°F 73% Clear. Quite cool. 49°F 7 mi	 7mph /NW 0% 0.00 "
2:00 am 51°F 43°F 75% Clear. Quite cool. 48°F 8 mi	 7mph /WNW 0% 0.00 "
3:00 am 50°F 42°F 76% Clear. Chilly. 47°F 8 mi	 7mph /WNW 0% 0.00 "
4:00 am 48°F 42°F 80% Clear. Chilly. 45°F 7 mi	 7mph /W 0% 0.00 "
5:00 am 47°F 42°F 82% Clear. Chilly. 44°F 7 mi	 7mph /W 0% 0.00 "
6:00 am 46°F 42°F 84% Sunny. Chilly. 43°F 8 mi	 7mph /W 0% 0.00 "
7:00 am 46°F 42°F 85% Sunny. Chilly. 42°F 8 mi	 7mph /WNW 0% 0.00 "
8:00 am 48°F 42°F 79% Sunny. Chilly. 45°F 8 mi	 7mph /WNW 0% 0.00 "
9:00 am 56°F 44°F 64% Sunny. Cool. 54°F 7 mi	 6mph /NW 0% 0.00 "
10:00 am 63°F 44°F 50% Sunny. Cool. 63°F 9 mi	 6mph /NW 0% 0.00 "
11:00 am 68°F 44°F 41% Sunny. Cool. 68°F 9 mi	 6mph /NW 0% 0.00 "
12:00 pm 71°F 42°F 35% Sunny. Cool. 77°F 9 mi	 7mph /WNW 0% 0.00 "
1:00 pm 73°F 41°F 32% Sunny. Mild. 77°F 15 mi	 7mph /WNW 0% 0.00 "
2:00 pm 75°F 41°F 30% Sunny. Mild. 77°F 16 mi	 7mph /W 0% 0.00 "
3:00 pm 77°F 42°F 29% Sunny. Mild. 77°F 17 mi	 8mph /W 0% 0.00 "
4:00 pm 77°F 42°F 29% Sunny. Mild. 78°F 18 mi	 8mph /W 0% 0.00 "
5:00 pm 77°F 44°F 31% Sunny. Mild. 78°F 14 mi	 8mph /WSW 0% 0.00 "
6:00 pm 75°F 45°F 34% Sunny. Mild. 77°F 9 mi	 8mph /SW 0% 0.00 "
7:00 pm 73°F 47°F 39% Sunny. Mild. 77°F 10 mi	 8mph /SSW 0% 0.00 "
8:00 pm 69°F 48°F 47% Clear. Cool. 69°F 9 mi	 8mph /SSW 0% 0.00 "
9:00 pm 64°F 49°F 59% Clear. Cool. 64°F 8 mi	 8mph /SSW 0% 0.00 "
10:00 pm 58°F 49°F 74% Clear. Cool. 56°F 7 mi	 8mph /SSW 0% 0.00 "
11:00 pm 57°F 50°F 77% Clear. Cool. 55°F 7 mi	 8mph /SSW 0% 0.00 "
12:00 am 58°F 50°F 76% Clear. Cool. 56°F 8 mi	 8mph /SSW 0% 0.00 "
1:00 am 56°F 51°F 83% Clear. Cool. 54°F 8 mi	 8mph /SSW 0% 0.00 "
2:00 am 55°F 51°F 85% Clear. Cool. 53°F 7 mi	 8mph /SSW 1% 0.00 "
3:00 am 56°F 52°F 86% Clear. Cool. 54°F 8 mi	 8mph /S 1% 0.00 "
4:00 am 55°F 52°F 90% Clear. Cool. 53°F 7 mi	 7mph /S 1% 0.00 "
5:00 am 55°F 53°F 92% Clear. Quite cool. 53°F 8 mi	 7mph /SSE 1% 0.00 "
6:00 am 55°F 53°F 93% Sunny. Quite cool. 53°F 8 mi	 7mph /SSE 1% 0.00 "
7:00 am 55°F 53°F 92% Sunny. Cool. 53°F 7 mi	 8mph /SSE 1% 0.00 "
8:00 am 58°F 54°F 87% Sunny. Cool. 56°F 7 mi	 8mph /SSE 1% 0.00 "
9:00 am 64°F 56°F 73% Sunny. Cool. 64°F 8 mi	 10mph /SSE 1% 0.00 "
10:00 am 72°F 57°F 60% Sunny. Cool. 76°F 8 mi	 11mph /S 1% 0.00 "
11:00 am 75°F 56°F 53% Sunny. Mild. 78°F 7 mi	 12mph /S 1% 0.00 "
12:00 pm 77°F 55°F 47% Sunny. Mild. 78°F 9 mi	 13mph /S 1% 0.00 "
1:00 pm 78°F 54°F 44% Sunny. Mild. 79°F 8 mi	 13mph /S 1% 0.00 "
2:00 pm 78°F 54°F 43% Passing clouds. Mild. 79°F -	 14mph /S 1% 0.00 "
3:00 pm 78°F 55°F 44% Passing clouds. Mild. 79°F -	 14mph /S 1% 0.00 "
4:00 pm 77°F 55°F 47% Passing clouds. Mild. 78°F -	 14mph /S 1% 0.00 "
5:00 pm 76°F 55°F 49% Passing clouds. Mild. 78°F -	 13mph /SSE 2% 0.00 "
6:00 pm 74°F 56°F 54% Passing clouds. Mild. 77°F -	 12mph /SSE 2% 0.00 "
7:00 pm 71°F 56°F 60% Passing clouds. Cool. 76°F -	 11mph /SSE 2% 0.00 "
8:00 pm 69°F 57°F 66% Passing clouds. Cool. 69°F -	 11mph /SSE 2% 0.00 "
9:00 pm 67°F 58°F 72% Passing clouds. Cool. 67°F -	 10mph /SSE 2% 0.00 "
10:00 pm 65°F 58°F 79% Passing clouds. Cool. 65°F -	 10mph /SSE 1% 0.00 "
11:00 pm 65°F 59°F 81% Passing clouds. Cool. 65°F -	 10mph /SSE 2% 0.00 "
12:00 am 65°F 59°F 82% Passing clouds. Cool. 65°F -	 10mph /SSE 2% 0.00 "
1:00 am 64°F 59°F 86% Passing clouds. Cool. 64°F -	 9mph /SSE 3% 0.00 "
2:00 am 64°F 60°F 87% Partly cloudy. Cool. 64°F -	 9mph /SSE 2% 0.00 "
3:00 am 63°F 60°F 88% Partly cloudy. Cool. 63°F -	 8mph /SSE 1% 0.00 "
4:00 am 63°F 60°F 90% Partly cloudy. Cool. 63°F -	 8mph /SSE 0% 0.00 "
5:00 am 62°F 60°F 92% Partly cloudy. Cool. 62°F -	 8mph /SE 2% 0.00 "
6:00 am 62°F 59°F 92% a mixture of sun and clouds. Cool. 62°F -	 9mph /SE 5% 0.00 "
7:00 am 62°F 59°F 92% a mixture of sun and clouds. Cool. 62°F -	 9mph /SE 7% 0.00 "
8:00 am 64°F 60°F 88% a mixture of sun and clouds. Cool. 64°F -	 10mph /SSE 6% 0.00 "
9:00 am 69°F 61°F 77% a mixture of sun and clouds. Cool. 69°F -	 11mph /SSE 4% 0.00 "
10:00 am 74°F 62°F 66% a mixture of sun and clouds. Mild. 77°F -	 12mph /SSE 2% 0.00 "
11:00 am 76°F 62°F 62% a mixture of sun and clouds. Mild. 78°F -	 13mph /SSE 2% 0.00 "
12:00 pm 78°F 62°F 59% a mixture of sun and clouds. Mild. 80°F -	 13mph /SSE 2% 0.00 "
1:00 pm 79°F 62°F 57% a mixture of sun and clouds. Mild. 80°F -	 14mph /SSE 2% 0.00 "
2:00 pm 79°F 62°F 56% a mixture of sun and clouds. Mild. 81°F -	 14mph /SSE 2% 0.00 "
3:00 pm 79°F 62°F 56% a mixture of sun and clouds. Mild. 80°F -	 14mph /SSE 1% 0.00 "
4:00 pm 79°F 62°F 57% a mixture of sun and clouds. Mild. 80°F -	 14mph /SSE 1% 0.00 "
5:00 pm 78°F 62°F 59% a mixture of sun and clouds. Mild. 79°F -	 13mph /SSE 1% 0.00 "
6:00 pm 76°F 62°F 62% a mixture of sun and clouds. Mild. 78°F -	 12mph /SSE 1% 0.00 "
7:00 pm 73°F 62°F 67% a mixture of sun and clouds. Mild. 76°F -	 11mph /SSE 1% 0.00 "
8:00 pm 71°F 62°F 72% Partly cloudy. Cool. 74°F -	 10mph /SSE 3% 0.00 "
9:00 pm 70°F 62°F 77% Partly cloudy. Cool. 72°F -	 10mph /SE 4% 0.00 "
10:00 pm 69°F 63°F 80% Partly cloudy. Cool. 69°F -	 10mph /SE 5% 0.00 "
11:00 pm 69°F 63°F 81% Partly cloudy. Cool. 69°F -	 11mph /SE 7% 0.00 "
12:00 am 69°F 63°F 81% Partly cloudy. Cool. 69°F -	 12mph /SE 10% 0.00 "
1:00 am 69°F 63°F 83% Partly cloudy. Cool. 69°F -	 12mph /SE 12% 0.00 "
2:00 am 69°F 64°F 84% Cloudy. Cool. 69°F -	 11mph /SE 10% 0.00 "
3:00 am 69°F 64°F 85% Cloudy. Cool. 69°F -	 9mph /SSE 7% 0.00 "
4:00 am 68°F 64°F 86% Cloudy. Cool. 68°F -	 8mph /SSE 5% 0.00 "
5:00 am 67°F 64°F 89% Cloudy. Cool. 67°F -	 7mph /SE 6% 0.00 "
6:00 am 67°F 64°F 92% a mixture of sun and clouds. Cool. 67°F -	 7mph /SE 7% 0.00 "
7:00 am 66°F 64°F 92% a mixture of sun and clouds. Cool. 66°F -	 8mph /SE 7% 0.00 "
8:00 am 67°F 64°F 91% a mixture of sun and clouds. Cool. 67°F -	 9mph /SE 6% 0.00 "
9:00 am 71°F 65°F 82% a mixture of sun and clouds. Cool. 71°F -	 11mph /SE 5% 0.00 "
10:00 am 73°F 65°F 75% a mixture of sun and clouds. Mild. 75°F -	 12mph /SSE 5% 0.00 "
11:00 am 74°F 65°F 72% a mixture of sun and clouds. Mild. 76°F -	 12mph /SE 8% 0.00 "
12:00 pm 75°F 65°F 70% a mixture of sun and clouds. Mild. 77°F -	 12mph /SE 12% 0.00 "
1:00 pm 75°F 64°F 68% a few showers. a mixture of sun and clouds. Mild. 77°F -	 12mph /SE 31% 0.00 "
2:00 pm 76°F 64°F 66% a few showers. a mixture of sun and clouds. Mild. 78°F -	 13mph /SE 26% 0.00 "
3:00 pm 78°F 64°F 63% a mixture of sun and clouds. Mild. 79°F -	 13mph /SE 10% 0.00 "
4:00 pm 78°F 64°F 61% a mixture of sun and clouds. Mild. 80°F -	 13mph /SE 7% 0.00 "
5:00 pm 77°F 63°F 64% a mixture of sun and clouds. Mild. 78°F -	 13mph /SSE 7% 0.00 "
6:00 pm 75°F 63°F 66% a mixture of sun and clouds. Mild. 77°F -	 11mph /SSE 7% 0.00 "
7:00 pm 73°F 63°F 70% a mixture of sun and clouds. Mild. 75°F -	 10mph /SSE 7% 0.00 "
8:00 pm 72°F 63°F 74% Cloudy. Mild. 74°F -	 13mph /SSE 7% 0.00 "
9:00 pm 71°F 64°F 77% Cloudy. Cool. 73°F -	 18mph /SSE 6% 0.00 "
10:00 pm 71°F 64°F 79% Cloudy. Cool. 72°F -	 21mph /SSE 5% 0.00 "
11:00 pm 70°F 64°F 81% Cloudy. Cool. 70°F -	 16mph /SSE 7% 0.00 "
12:00 am 68°F 64°F 86% Cloudy. Cool. 68°F -	 9mph /SE 10% 0.00 "
1:00 am 67°F 64°F 89% Sprinkles. Cloudy. Cool. 67°F -	 6mph /N 25% 0.00 "
2:00 am 67°F 64°F 92% Sprinkles. Cloudy. Cool. 67°F -	 7mph /NNE 26% 0.00 "
3:00 am 68°F 65°F 89% Sprinkles. Cloudy. Cool. 68°F -	 7mph /ENE 27% 0.00 "
4:00 am 68°F 65°F 90% Sprinkles. Cloudy. Cool. 68°F -	 7mph /ENE 28% 0.00 "
5:00 am 67°F 65°F 92% Sprinkles. Cloudy. Cool. 67°F -	 7mph /E 32% 0.00 "
6:00 am 67°F 65°F 93% Sprinkles. a mixture of sun and clouds. Cool. 67°F -	 7mph /ESE 36% 0.00 "
7:00 am 67°F 65°F 93% a few showers. a mixture of sun and clouds. Cool. 67°F -	 7mph /ESE 40% 0.00 "
8:00 am 68°F 64°F 86% a few showers. a mixture of sun and clouds. Cool. 68°F -	 7mph /SE 39% 0.00 "
9:00 am 71°F 64°F 78% a few showers. Cloudy. Cool. 72°F -	 7mph /SE 39% 0.00 "
10:00 am 75°F 66°F 75% a few tstorms. Cloudy. Mild. 76°F -	 8mph /SE 38% 0.00 "
11:00 am 77°F 66°F 71% a few tstorms. Cloudy. Mild. 78°F -	 8mph /SSE 38% 0.01 "
12:00 pm 78°F 66°F 67% a few tstorms. Cloudy. Mild. 80°F -	 9mph /SSE 38% 0.01 "
1:00 pm 79°F 66°F 64% a few tstorms. Cloudy. Mild. 81°F -	 10mph /SSE 37% 0.00 "
2:00 pm 79°F 65°F 64% a few tstorms. Cloudy. Mild. 81°F -	 10mph /SSE 31% 0.00 "
3:00 pm 77°F 65°F 66% a few tstorms. Cloudy. Mild. 79°F -	 10mph /S 26% 0.00 "
4:00 pm 76°F 65°F 70% Cloudy. Mild. 77°F -	 10mph /S 10% 0.00 "
5:00 pm 74°F 65°F 73% a few showers. Cloudy. Mild. 76°F -	 9mph /S 26% 0.01 "
6:00 pm 72°F 66°F 82% a few showers. Cloudy. Cool. 71°F -	 8mph /S 33% 0.01 "
7:00 pm 70°F 66°F 88% a few showers. Cloudy. Cool. 70°F -	 8mph /S 40% 0.02 "
8:00 pm 69°F 66°F 90% a few showers. Cloudy. Cool. 69°F -	 8mph /S 40% 0.02 "
9:00 pm 69°F 66°F 92% a few showers. Cloudy. Cool. 69°F -	 8mph /S 41% 0.02 "
10:00 pm 68°F 67°F 94% a few showers. Cloudy. Cool. 68°F -	 9mph /SSW 41% 0.02 "
11:00 pm 68°F 66°F 93% a few showers. Cloudy. Cool. 68°F -	 8mph /SSW 41% 0.00 "
12:00 am 67°F 66°F 95% a few showers. Cloudy. Cool. 67°F -	 7mph /SSW 41% 0.00 "
1:00 am 67°F 66°F 97% a few showers. Cloudy. Cool. 67°F -	 7mph /SW 41% 0.00 "
2:00 am 66°F 65°F 96% Cloudy. Cool. 66°F -	 8mph /WSW 8% 0.00 "
3:00 am 65°F 64°F 96% Cloudy. Cool. 65°F -	 8mph /W 7% 0.00 "
4:00 am 65°F 64°F 96% Cloudy. Cool. 65°F -	 8mph /WNW 10% 0.00 "
5:00 am 64°F 63°F 96% Cloudy. Cool. 64°F -	 7mph /WNW 12% 0.00 "
6:00 am 64°F 62°F 95% Cloudy. Cool. 64°F -	 6mph /WNW 6% 0.00 "
7:00 am 64°F 62°F 94% Cloudy. Cool. 64°F -	 6mph /WNW 7% 0.00 "
8:00 am 65°F 63°F 92% Cloudy. Cool. 65°F -	 6mph /NW 6% 0.00 "
9:00 am 68°F 64°F 87% Cloudy. Cool. 68°F -	 7mph /NNW 11% 0.00 "
10:00 am 72°F 65°F 80% Cloudy. Cool. 72°F -	 7mph /NNW 10% 0.00 "
11:00 am 75°F 65°F 71% Cloudy. Mild. 77°F -	 7mph /NNW 10% 0.00 "
12:00 pm 78°F 64°F 62% Cloudy. Mild. 80°F -	 6mph /NNW 11% 0.00 "
1:00 pm 81°F 64°F 55% Scattered clouds. Warm. 83°F -	 6mph /NNW 11% 0.00 "
2:00 pm 82°F 63°F 53% Scattered clouds. Warm. 83°F -	 6mph /NW 11% 0.00 "
3:00 pm 82°F 62°F 52% Scattered clouds. Warm. 83°F -	 4mph /NW 10% 0.00 "
4:00 pm 80°F 62°F 55% More sun than clouds. Mild. 81°F -	 4mph /W 10% 0.00 "
5:00 pm 80°F 63°F 55% More sun than clouds. Warm. 82°F -	 5mph /SSW 10% 0.00 "
6:00 pm 79°F 64°F 60% Passing clouds. Mild. 80°F -	 8mph /SSW 11% 0.00 "
7:00 pm 77°F 64°F 64% Passing clouds. Mild. 79°F -	 8mph /S 11% 0.00 "
8:00 pm 74°F 64°F 72% Passing clouds. Mild. 76°F -	 7mph /SSW 11% 0.00 "
9:00 pm 71°F 64°F 78% Passing clouds. Cool. 72°F -	 7mph /WSW 11% 0.00 "
10:00 pm 67°F 63°F 86% Passing clouds. Cool. 67°F -	 7mph /W 10% 0.00 "
11:00 pm 66°F 62°F 85% Passing clouds. Cool. 66°F -	 7mph /WNW 10% 0.00 "
12:00 am 65°F 60°F 83% Passing clouds. Cool. 65°F -	 7mph /NNW 10% 0.00 "
Sprinkles early. Clearing skies. Warm. APRIL 19TH, 1941 The temperature at Sodus NY soared to 95 degrees. The next day Albany NY reported a record for April of 93 degrees. APRIL 18TH, 1880 More than two dozen tornadoes were reported from Kansas and Arkansas to Wisconsin and Michigan. More than 100 persons were killed, including 65 persons at Marshfield MO. APRIL 18TH, 1944 California experienced its worst hailstorm of record. Damage mounted to two million dollars as two consecutive storms devastated the Sacramento Valley destroying the fruit crop. APRIL 17TH, 1922 A family of at least six tornadoes caused death and destruction along parts of a 210 mile path from north of Ogden IL to Allen County OH, killing sixteen persons. A post card, picked up in Madison County IN, was found 124 miles away near Mount Cory OH. APRIL 17TH, 1965 The Mississippi River reached a flood crest at Saint Paul MN four feet higher than any previous mark. During the next two weeks record levels were reached along the Mississippi between Saint Paul and Hannibal MO. Flooding caused more than 100 million dollars damage, but timely warnings kept the death toll down to just twelve persons. APRIL 16TH, 1851 The famous "Lighthouse Storm" raged near Boston Harbor. Whole gales and gigantic waves destroyed Minot Light with its two keepers still inside. The storm resulted in great shipping losses and coastal erosion. APRIL 16TH, 1933 Franklin Lake NH was buried under 35 inches of snow. APRIL 15TH, 1921 Two mile high Silver Lake CO received 76 inches of snow in 24 hours, the heaviest 24 hour total of record for North America. The storm left a total of 87 inches in twenty-seven and a half hours. APRIL 15TH, 1927 New Orleans LA was drenched with 14.01 inches of rain, which established a 24 hour rainfall record for the state. APRIL 14TH, 1886 A devastating tornado, 800 yards in width at times, cut a twenty mile path through Saint Cloud MN killing 74 persons. The bottom of the Mississippi River was said to have been seen during the tornado's crossing. Eleven persons were killed at a wedding party near the town of Rice.